Does anybody here use crystals or minerals to scry? Posted: Wed Sep 28, 2011 5:59 pm Post subject: Does anybody here use crystals or minerals to scry? Does anyone here use their crystals or minerals to scry? What's your favorite tool? I'm partial to spheres. It's an easy choice for me, since I find them very pleasing to the eye and I could look at them all day. I have a few optically-clear fused quartz spheres, but I also have a few natural quartz spheres that do have inclusions. Either tool produces results. But I know some people prefer substances that are dark, opaque, or reflective rather than transparent. On another forum, we've got an active thread going where people are using various shapes or raw samples of stones like obsidian (various types), labradorite, moonstone, and selenite, to name a few. In the past, I've used non-spherical minerals like a thumb-sized quartz point and the faceted gem in a class ring. Fpr me, it's all about distracting the physical eye so the senses that fall outside the range of the standard five senses can get to work. I can verify that size does NOT matter, or at least it doesn't have to. 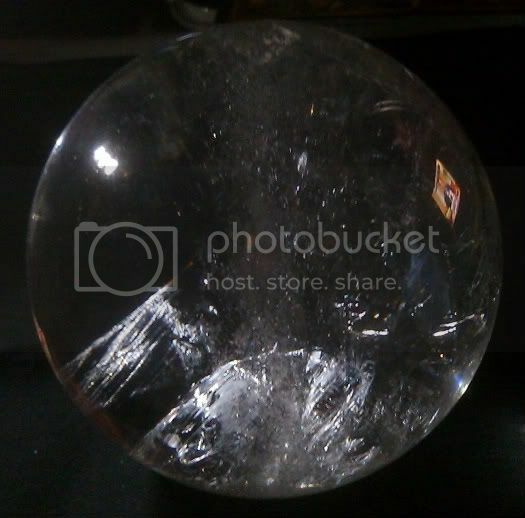 I was in high school when I learned scrying, and as I didn't have anywhere near enough money to buy a real crystal ball, I learned by using an optically clear glass marble. I was too young to second-guess myself or think it was a crazy idea -- I went into the process presuming it would work, and so it did. Unlike the description of the vast majority of internet articles on scrying, I have never once seen the sphere "cloud up", nor do I ever see images in the sphere itself. The sphere serves as a pleasant distraction for my eyes, so my third eye can get to work perceiving what it is I'm looking for. Any images that I see are always perceived "in my head", never in the sphere. Sometimes I feel like *I* ought to write an article about scrying, since so few of the articles that are currently available online describe an experience that matches (or even resembles) mine. I'm sure I'm far from the only one who experiences scrying in this manner. 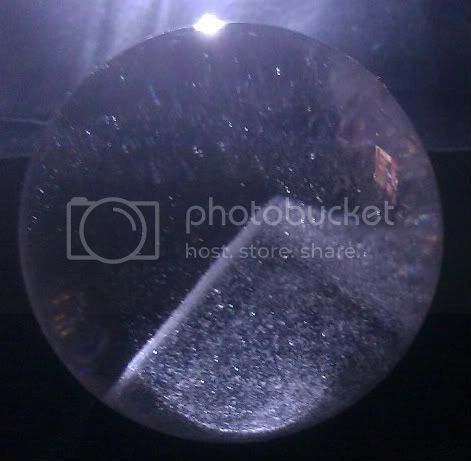 My Phantom Quartz sphere, about 2.5" in diameter. My largest natural quartz sphere, approximately 3.5" in diameter. The description on the site where I bought it said the sphere was "elestial". It seems awfully transparent to me to be elestial, but I don't mind. I didn't even know the word elestial existed until I saw this sphere online for purchase, so it wasn't a factor in my realizing that I *needed* this sphere. For gosh sakes. I can't fix the typo in my previous post. Does anyone know how to edit posts?